I have got both Freebies and a tutorial for you this week. 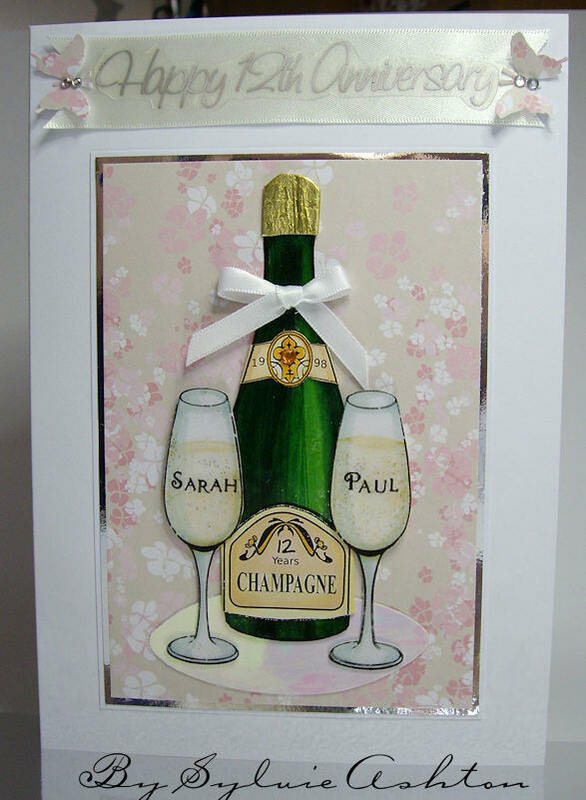 I was asked to make a card with a bottle of Champagne and glasses. I have made two cards, one is the ordered one and the second one is for this tutorial. 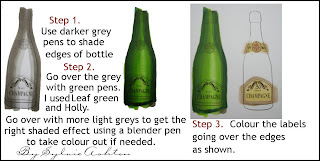 And here's the bottle and glass for you to print out. 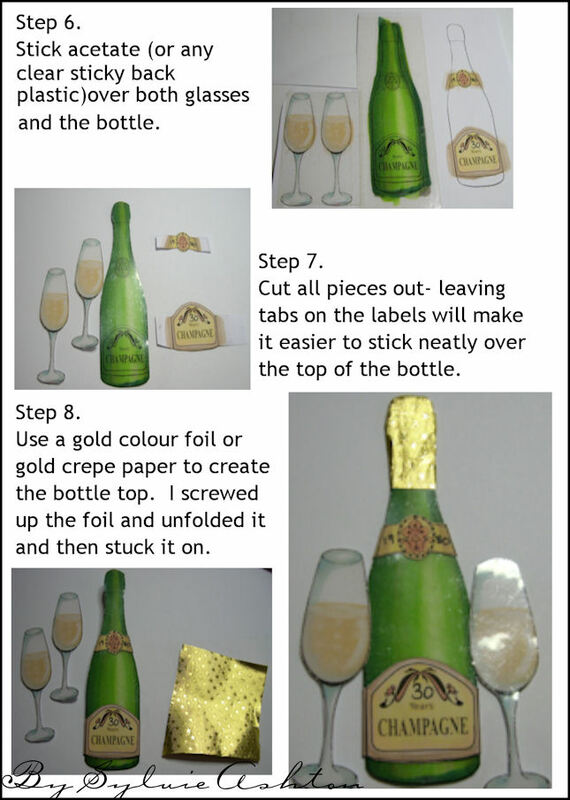 You will need 2 print-outs to make the bottle.. and print as many glasses as you need. As I have decided to do a Pearl wedding card I have put 1980 on the top label and written the number 30 on the bottom label.. the free image has blank spaces for you to add anything you want. I hope this inspires you to make a celebration bottle of Champagne with glasses on a card too. WOW! What fantastic digital images. Have been thinking of something along this line for a card I need to make next month. Perfect timing and perfect images along with some suggestions to help me along. Lovely tutorial. Thank you for the images. These are just stunning! I've been stamping only 10 or so years, but this champagne bottle is the most perfect I've ever seen! Thank you so much! It will be perfect for my anniversary cards! Thanks for these, I'm sure I'll find them useful and your cards are awesome .. when I first saw the cards I thought the bottle and glasses were ready coloured but then saw that you coloured them.. wow your colouring is perfect !!! thanks for all your work and for sharing so generously. Thanks for these great images and the directions,they should help. Yours look pretty realistic. Thanks so very much! Love the shape of the glass! Ooooooo just got to have a go with these, thank you so much for the tutorial. Thanks for the fantastic images. 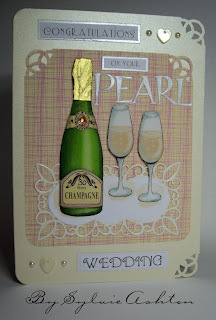 I will be celebrating my 30 anniversary in August, so it will be great on a scrapbook page! Beautiful cards! I saw your post on Create with TLC and I'm glad I did. You have an awesome blog and I'm now a follower! These are great images and the tutorial is well done. Also I love your finished card! Thanks for the freebies and the tutorial on how to colour them brillant. Wow, I love these cards and images! Thank you! great job, it looks perfect...have a wonderful weekend! 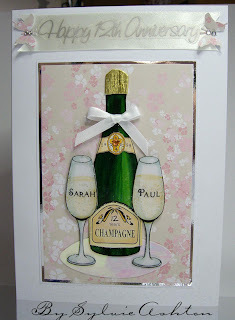 This is a gorgeous add on wedding cards! Thank you for sharing your time and talents. Thanks for sharing your freebies and tutorials. Oh Sylvie, this is just a fantastic tutorial. Thank you very much it was a good read.